Update 9:06am: Nope. It turns out the annual nightmare that is April Fool’s Day is no longer relegated to just April 1st. This watch is totally fake, and everything on the internet is officially insufferably terrible. Only 12 Americans have ever stepped foot on our moon, and given NASA’s recent budget constraints, there’s little chance we’ll be sending anyone up there again anytime soon. So if you’ve always wanted to experience the moon first hand, this unique timepiece is probably as close as you’ll ever get. The aptly-named Lunar Watch doesn’t boast any fancy complications, and it isn’t breaking any new ground when it comes to tourbillon engineering. But what justifies its $27,500 price tag is a housing made from a solid piece of 4.5-billion-year-old moon rock, collected from our lunar neighbor back in 1974 by the Soviet’s Luna probe. So it’s expensive. But when you crunch the numbers on how much it costs to harvest genuine moon rocks, $27,500 almost sounds reasonable. 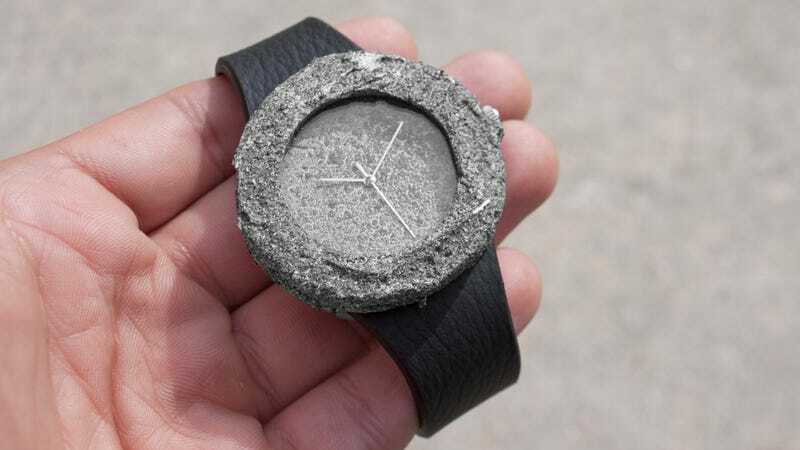 And the company behind this creation, the Analog Watch Company, is only making 25 of them, so it’s not like every kid on the block will be wearing one within a week’s time. If you decide to skip that mid-sized sedan and put your money towards one of these instead, there’s at least some guarantee you won’t ever run into anyone else on the planet who’s also wearing one.